The UN Commemorative Service was held at the UN Memorial Cemetery at Busan on 26 April. Busan (once Pusan) was the pocket on the south east coast of Korea where the initial North Korean attack was halted in August 1950. After two months of fighting UN, mainly US forces broke out of the Pusan Perimeter and forced the North Koreans back up the peninsula. The landing at Inchon, near Seoul, on 15 September 1950 saw the final defeat of the North Korea south opf the 38th parallel. The United Nations Memorial Cemetery in Korea was established in 1951. There are 281 Australians among the 2300 burials at Busan. And 378 Canadians, 885 Britons, 34 New Zealanders, 462 Turks, 117 Dutch, and 44 French. 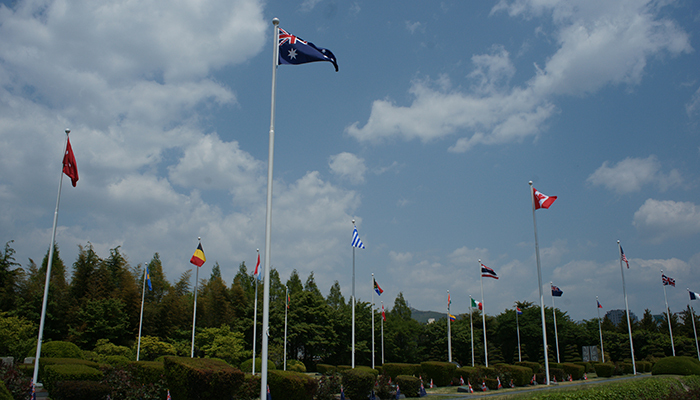 Flags of the 21 nations that offered support fly over the symbolic cemetery. There are 36 graves from the United States and South Korea – nearly all were repatriated. 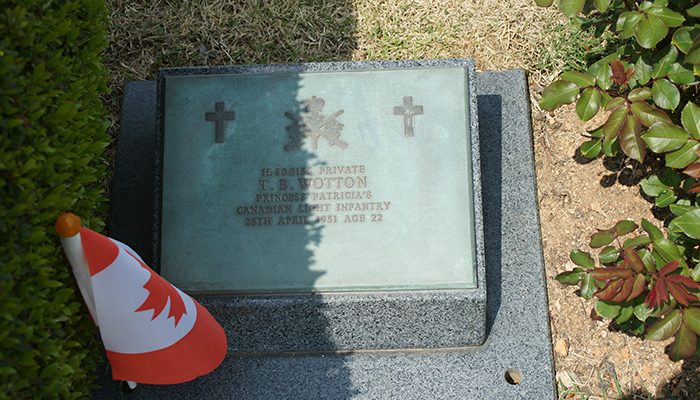 Of the 32 Australians who were killed in action or died of wounds at Kapyong, 30 are buried at Busan. Corporal William Kevin Murphy (B Company, 3RAR) is remembered on the Memorial to the Missing within the cemetery with 43 other Australians– including 19 from the RAAF and three from the RAN. Private Noel Heathwood (HQ Company) died in Japan on 30 April 1951 of wounds suffered at Kapyong and is buried in the Yokohama Military Cemetery in Japan. Private Horace ‘Slim’ Madden was one of three 3RAR men taken prisoner at Kapyong. ‘Private Madden was held prisoner by the enemy until about 6th November, 1951, when he died of malnutrition and the result of ill-treatment. During this period he openly resisted all enemy efforts to force him to collaborate, to such a degree that his name and example were widely known through the various groups of prisoners. Testimonials have been provided by Officers and men from many units of the Commonwealth and Allied Forces which show that the heroism he displayed was quite outstanding. Despite repeated beatings and many other forms of ill-treatment inflicted because of his defiance to his captors, Private Madden remained cheerful and optimistic. Although deprived of food because of his behaviour, resulting in severe malnutrition, he was known to share his meagre supplies purchased from Koreans with other prisoners who were sick. Second Lieutenant Dennis Fielden (16 Field Regiment) was the first New Zealander killed in the Korean War – at Kapyong on 24 April 1951, serving as Forward Observation Officer with A Company, 3RAR on the Hill 504 ridge. The A Company position had been initially so quiet that Fielden’s signaller was asleep. In the confusion of the sudden Chinese attack at around 1 am that night he was woken, told to get out up the ridge. Fielden was killed as he left the scrape to do the same. His body was not recovered until 27 May 1951. Lt Fielden was born in England in 1918 and had served seven years with the RAF and the Royal Artillery. He was posthumously Mentioned in Dispatches for his conduct at Kapyong. Lieutenant Colonel Charles Hercules Green was the first fighting commander of 3RAR in Korea. He died of wounds on 1 November 1950 after the victories at the Broken Bridge, Apple Orchard and Chongju- just a month after 3 RAR deployed to Korea. A North Korean shell hit a tree, and a large piece of shrapnel ripped through Colonel Green’s tent. He was the only one injured. He was initially buried in the Pyongyang Cemetery and was reinterred in the United Nations Memorial Cemetery in 1951. Private James Patrick Daunt was killed in action on 6 November 1951 near Pakchon, now in North Korea. His roll of honour circular as filled in by his father, a NSW coal miner, states he was 21. 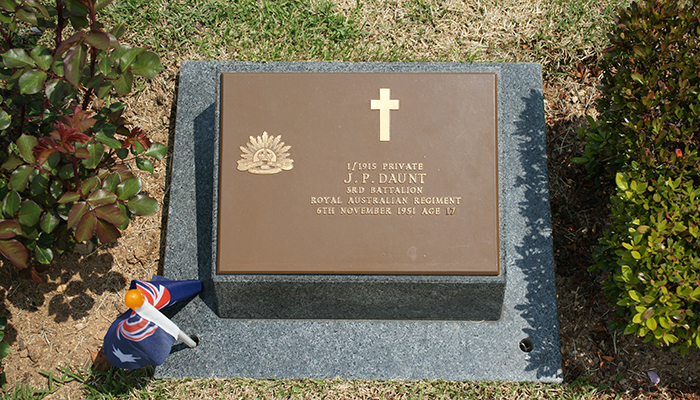 His headstone has been altered – he was actually 17 and the youngest Australian to die in the Korean War. Private Daunt was born 2 July 1934. He marched in 3 RAR on 25 October 1951, and was killed just 13 days later – aged 17.